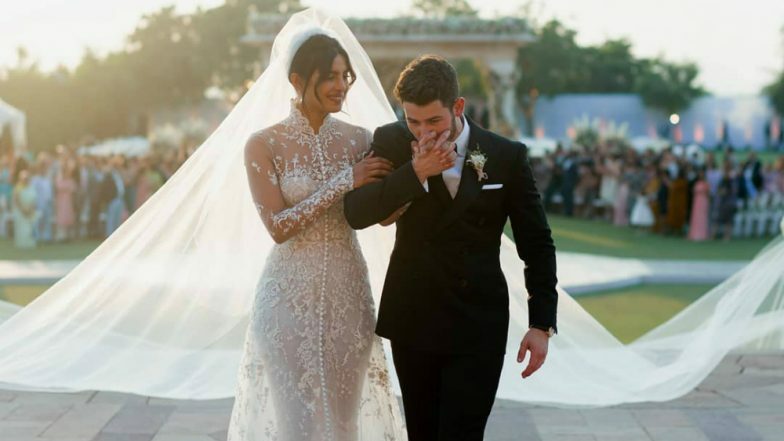 Are we still talking about Nick Jonas and Priyanka Chopra's wedding? You bet we are. We are a hundred percent sure that a lot of details from the wedding of the year have been left out from reaching the public. For instance, the latest revelation that the Baywatch actress made on a talk show. Priyanka is promoting her upcoming YouTube special, If I Could Tell You Just One Thing, for which she was on Watch What Happens Live with Andy Cohen. The host asked reminded her that in 2017 he had asked Priyanka if there was something cooking between her and Nick. Priyanka had denied the relationship back then. So, the host, Andy Cohen, asked the actress a series of questions about her December wedding in Jodhpur. "Who cried the most during vow exchanges?" he asked. Priyanka replied, "Nick,"
Isn't Nick a sweetheart? Priyanka also mentioned that her husband cried when he saw her in the wedding gown for the first time. Earlier, on another talk show, Priyanka had revealed a detail about the time when Nick proposed marriage to her. Priyanka said that she told Nick right away that doesn't know how to cook. Nick had replied, "Neither do I,"
Priyanka and Nick got married to each other in Jodhpur. They held two wedding ceremonies - on by Hindu rituals and the other by Catholic rituals. The two had a Swiss honeymoon. And have starred in a music video together already. The comeback song of the Jonas Bros, titled Sucker, featured Priyanka along with Sophie Turner, Joe's fiancee, and Daniele, Kevin's wife. We are waiting to see more of Joe and Priyanka share the screen space.